On Saturday 30 March, a group of 89 students from Germany had the privilege of meeting with Hazrat Khalifatul Masih V(aba) for a mulaqat. The students had the opportunity to ask Huzoor(aba) various questions and to seek guidance on various matters that they were facing. As Huzoor(aba) arrived, he enquired as to how many students had come. Huzoor then graciously opened the floor to the students who began asking the questions they had. One student asked Huzoor(aba) that during the recent series of Friday Sermons, muwakhat (system of brotherhood) between the companions had been mentioned. The student further went on to say that this system had now started in Germany and asked Huzoor(aba) how one could achieve nafs-e-mutmainnah (spiritual solace) through this system. 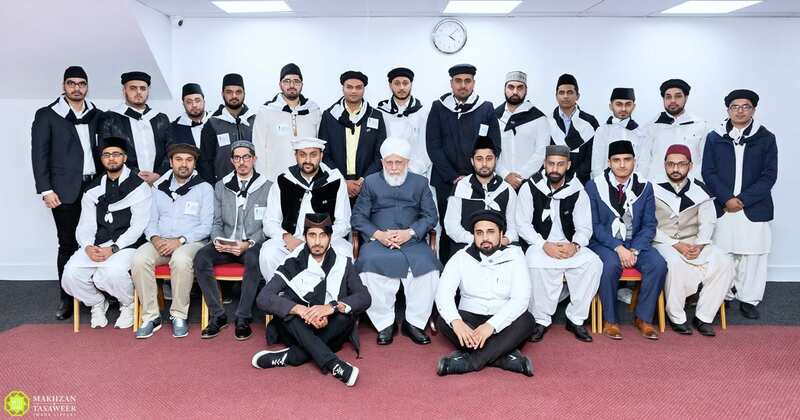 A student expressed his desire to become a teacher to Huzoor(aba) and went on to say that in schools, teachers had the responsibility to teach a certain topic which we as, Ahmadi Muslims, may not believe. The student, giving the example of the theory of evolution, further asked Huzoor(aba) that if faced with such a situation, what should be done. Similar to the previous question, one Khadim said to Hazrat Khalifatul Masih(aba) that he was a teacher and was currently teaching Islam in school. He said to Huzoor(aba) that some people had issues with Ahmadi Muslims teaching Islam to their Muslim children.